One person is dead following a motor vehicle accident Thursday evening in Clearwater. Lois Johnson, 83, of O’Neill, died from injuries sustained in the accident which took place shortly before 6 p.m. 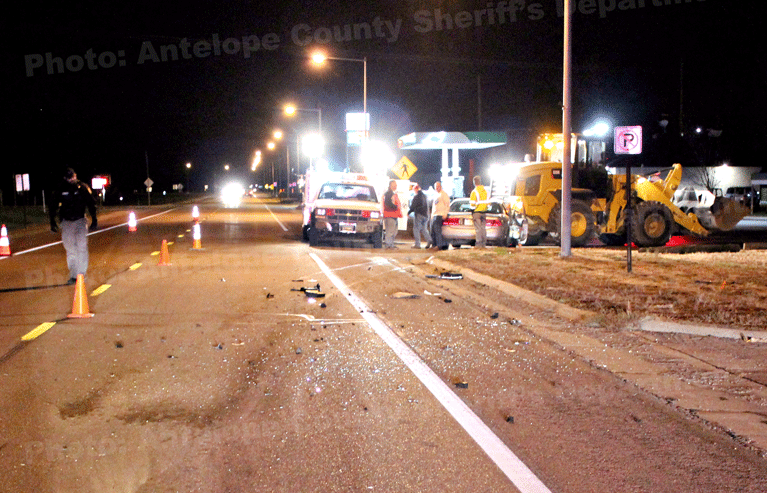 According to the accident report from the Antelope County Sheriff’s Department, law enforcement and rescue personnel were called to Clearwater at 5:51 p.m. to respond to a two-vehicle accident near the intersection of Colorado Street and Hwy 275. “A silver 2004 Buick LeSabre was traveling westbound on Hwy 275 when it struck a westbound Caterpillar front end loader. The driver of the loader, Jeremy Paul Hanson, 45, from Spicer, Minn., was traveling on the shoulder of Hwy 275 signaling to make a right turn onto Colorado Street and was operating with all warning lights activated,” according to the accident report. The report said Clearwater Fire and Rescue responded to the scene. Both Johnson and wife, Lois Johnson, 83, who was sitting in the front passenger seat were transported to Antelope Memorial Hospital by Clearwater Rescue. Mrs. Johnson succumbed to fatal injuries sustained in the accident. Clayton was admitted to AMH for treatment. Both occupants of the Buick were not restrained at the time of the accident. Alcohol and speed were not a factor in the accident, the report said.